The character is going to be based on one of the four horses of the apocalypse -- Pestilence. ?? idk. What are some other equiney petpets? Or just colour/whatever match ideas are fine too! 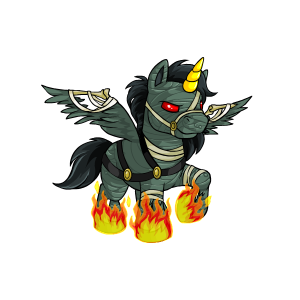 Re: Petpet match ideas for a Nightsteed? I personally like the Froiler, but it might not be the color combo you're looking for. I have one for my Magma Uni, based on the Magic: the Gathering "Nightmare." The Nightsteed was from the Lost Desert, maybe something along that line? Wow, thanks for the great ideas. I do like the darigan ukali's art. I love the art on the MTG Nightmare card. I was totally going to do a similar black/creeper char for Pestilence (who I just received today! Need to buy an MP for him). 'Tis my favorite in all the game, and my black deck always has one in it. This thread is now kind of moot, I got an UC offer on Pestilence and, since he only cost me a 3m custom in the first place, I jumped on it (cheapest jump to the UC class ever). But... will reserve these ideas for a future Nightsteed, if I need one!